And this is the part where Shelby takes a deep, cleansing breath and finally gets to post! As some of you know, I’m pursuing an MFA in creative writing from Vermont College of Fine Arts and my final “packet” (big old bunch of stuff–creative work, critical essays, annotated bibliography, letter, list of reasons why I’m not lame, etc.) of the semester is due on Wednesday, which is also my birthday. In addition to wrapping everything up, my computer decided to totally die on me. I’ve been eyeing new computers anyway, so when I saw that one I wanted also had a $100 off coupon from Costco, Kevin went out and bought it that day. However, transferring everything from one computer to the other turned out to be pretty much a 24-hour process, during which I was working off my thumb drive on Kevin’s Macbook and NOT doing anything relating to MYWTM. Obviously. But anyway, I am mostly back in action, so thanks for sticking around! If you didn’t die of boredom from that last paragraph, that is. This Place Where You Buy Food is brought to you by Coca-Cola! And seriously, how weird is it to see “Coca-Cola” typed out like that? I had to check and make sure it wasn’t “Coco-Cola.” It’s brought to you by Coke, okay? Yes, it says Corner Cafe. 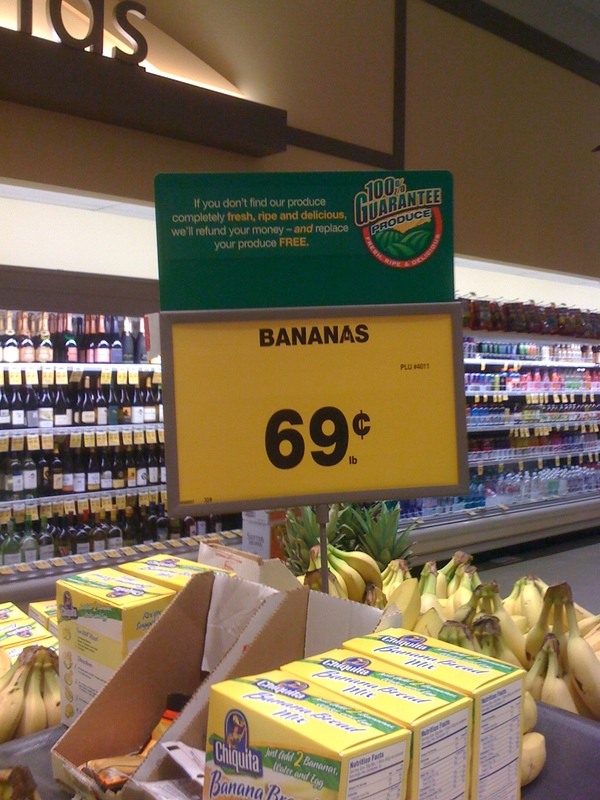 Now isn’t that a MUCH better name than Refreshment Corner? Yes, it is. 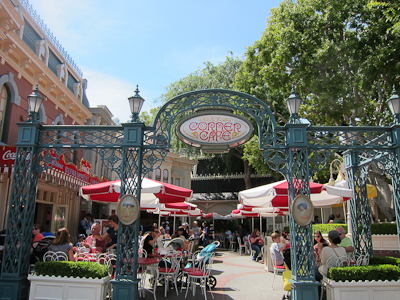 However, the Disneyland site doesn’t make any reference to the Corner Cafe. 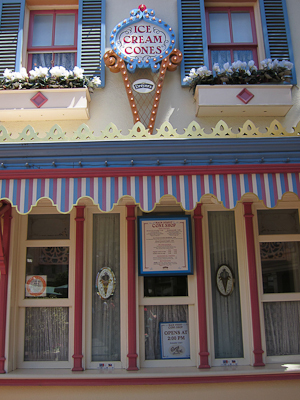 I suppose they don’t want it to be confused with the Carnation Cafe which is a few stores back down Main Street, but still. I mean, did they just spend all that money on the cute little Corner Cafe sign so they left it up and hoped nobody would notice? I don’t know. 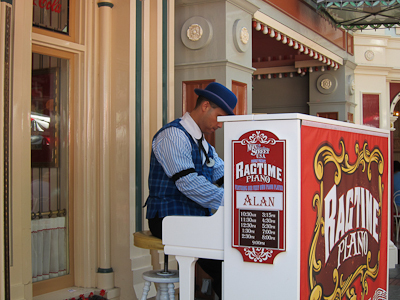 The best part of the Corner Cafe other than walking along its edge is sort of a shortcut to Adventureland, is the Ragtime pianist. Let’s take a closer look at our natty friend. I just think these costumes are adorable. 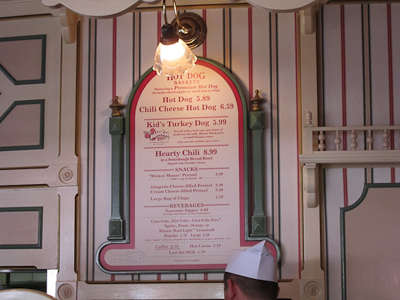 The menu of the day–well, every day–calls for hot dogs. They do offer turkey dogs, but only on the children’s menu. Weird. If a hot dog and/or chili isn’t quite your liking, you can also get a Mickey shaped pretzel. And shockingly, a variety of Coke products. Except not root beer! 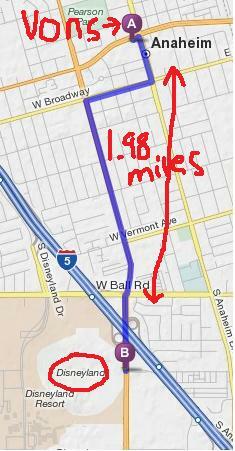 This is my real pet peeve about Disneyland. I don’t drink caffeine and I’m not a huge Sprite person. Is it too much to ask for root beer? Barq’s is Coke’s brand (and yes, I know it has a very small amount of caffeine, but I can tolerate that). Yet only a handful of places actually carry the root beer. Why not? Do that many people really buy Fanta, that we need to replace the root beer with Fanta? WHO BUYS FANTA??? Other than my husband, that is. 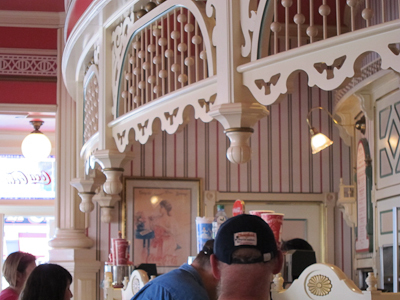 The Corner Cafe also features some cute detail above the registers. 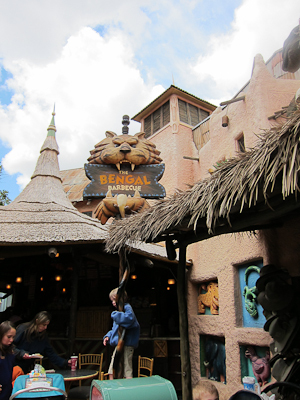 So, the Refreshment Corner or the Corner Cafe–whatever you want to call it, there it is. Fruit Cart, Lockers, and a Surprise! 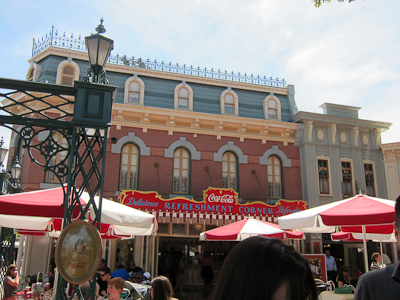 Main Street, U.S.A. is supposed to be a replica of a typical Midwestern main street in 1908. 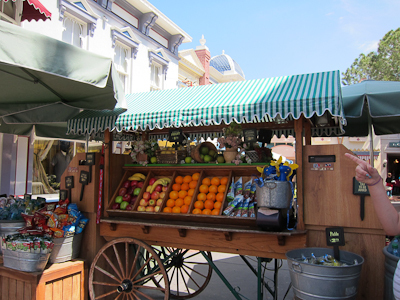 About halfway down Main Street you get to the lockers, which are set back from the regular street by an entrance that is more or less blocked by a fruit cart. I'm pretty sure you could have purchased an entire pear tree for $1.79 back in 1908. Partridge not included. 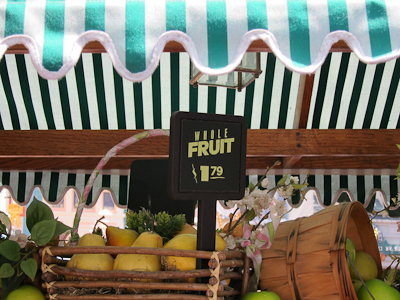 There are also other foods on the fruit cart. Moving past the fruit cart into what I can only assume is supposed to be an alley, you reach the lockers. Also that’s a key in the lock above the doorway. How cute! 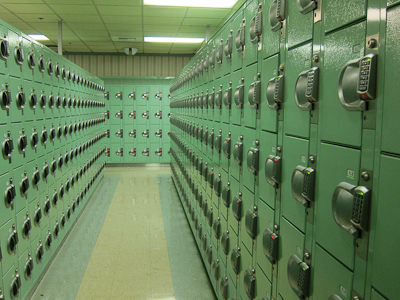 You can actually pay for your locker by credit card. Gone are the days when you just shoved your quarters into the locker’s door and then pulled out your key attached to a safety pin and hoped to God you didn’t lose it. Now it’s all high tech. 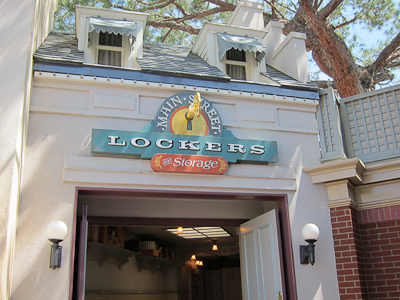 And in a very un-Disney-like fashion, the lockers actually look like a prison. 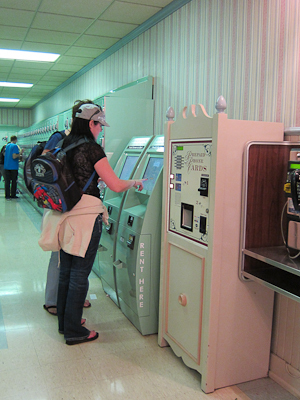 Yes, kiddies--these are called "pay phones." Go ask Grandma how they work. 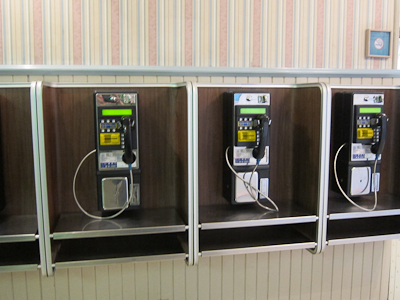 I really never realized that there is a complete dearth of pay phones these days until a friend of mine was visiting from another country and did not have a cell phone and had to call me from pay phones to arrange a get-together. I’m sure one day these will be replaced, like with some kind of electric visor you put over your head and then you just think about the person you’d like to call and it dials them directly. Until then, bring your quarters. And here’s where we get to the surprise. 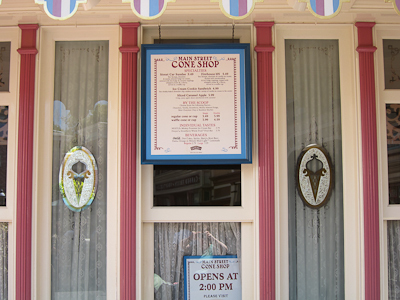 Right next to the lockers is an ice cream window! 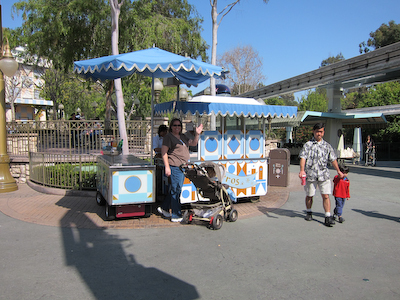 Well hello, delicious frozen treat vendor! Fancy meeting you here! Basically all of the buildings back here are fake with false fronts, so it never occurred to me that there might be a real, functioning thing here. Particularly since I have no need to put my stuff in jail a locker. 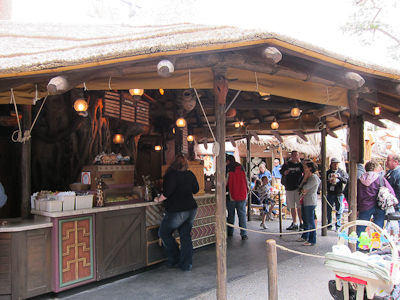 It’s Snack Time–Popcorn and Churros! 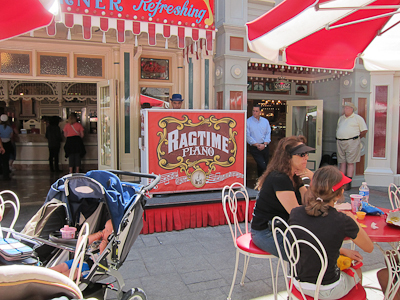 Disneyland makes more money on food than anything else. Or at least that’s what someone told me once, but I would totally believe it. I’m not going to eat at all of the restaurants for this blog (unless you want to open up a donation fund for me to eat everywhere), but I am addicted to Disneyland snacks. Well, two really–their popcorn and churros. 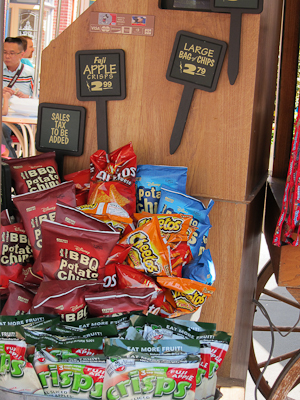 Popcorn and Churros are sold from carts conveniently labeled “Popcorn” and “Churros.” Your very first introduction to Disneyland snacks are the popcorn and churro carts on Main Street. 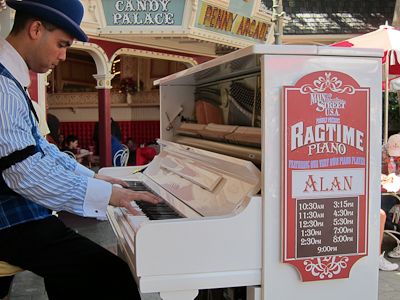 After that you will find them scattered throughout the park. 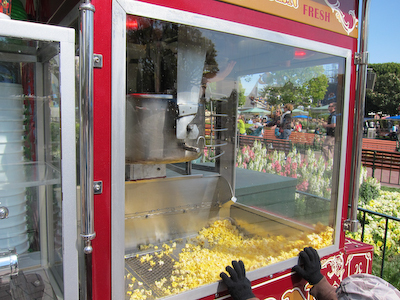 And then the second area is the cash register hidden by a cute little miniature popcorn turner thingy. Well, it would be cute if it didn’t have a clown. Clowns freak me out. 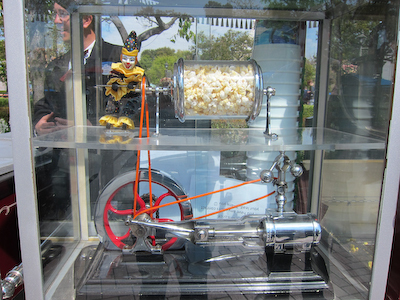 Fortunately, these little clowns are trapped behind glass cranking away at their popcorn thingies in perpetuity. The popcorn cart by the Matterhorn has a little Abominable Snowman instead of a clown. Now THAT is cute. This past trip to the park, I decided to get a churro to show you all. Churros are awesome. 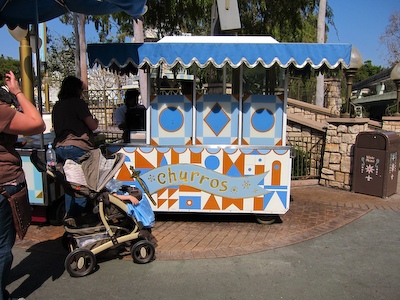 First I had to find a churro cart. 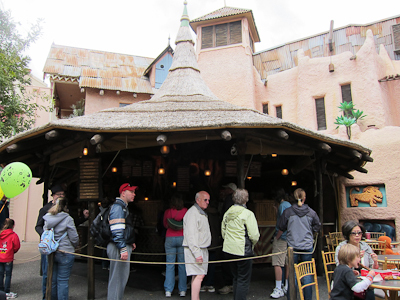 Fortunately my friend Kelli knew exactly where one was–this was on the way to Small World. I should probably take a moment to mention that the churro and popcorn carts all have a little annexed cooler with beverages available at the low low price of a million dollars a bottle (or whatever). Here’s a good tip from Shelby–bring your own water bottle. ANYway, the churros at Disneyland (I was horrified to find that they were different at the Mouse-in-Law) are frozen, and then they stack them up on one of those heater conveyer belts, like when you were in college eating dorm food and they had the toaster death trap that you put your piece of bread on and then waited a bit and hoped it came out on the bottom in some sort of edible condition? Like that. Except there’s no risk with Disneyland churros, since the little piece of heating machinery is pretty much made precisely to heat up frozen Disneyland churros. So the toaster thingy heats it up, and the outside of the churro gets this nice crisp that can only come from fried foods that aren’t good for you. 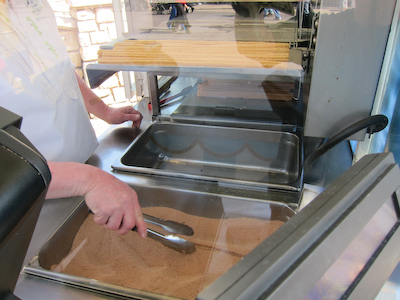 Once it comes out of the heater, the cast member drops it into a bin of cinnamon sugar and rolls it around. If you’re me, you ask them to give it a second roll before they hand it to you. The thing that horrified me at the Mouse-in-Law was that their churros are not heated fresh before your eyes, and they’re not hand-dipped in the cinnamony-sugary goodness. They’re pre-heated and pre-dipped. I was so disappointed I almost cried. Theo ate it though. He’s not as picky as I am. 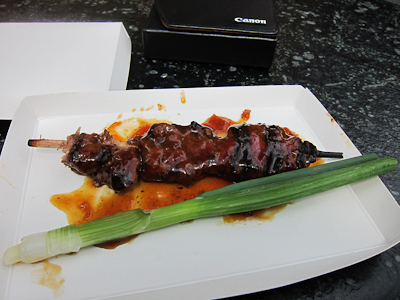 Anyway, then they wrap your delicious churro in a piece of paper and off you go! Delightfully crunchy on the outside, deliciously chewy in the middle, hot and sugary. And if you’re with Theo, you will hear an endless litany of “bite? bite? bite? bite?” until you can physically prove that the churro is gone and there are no more bites to be had. 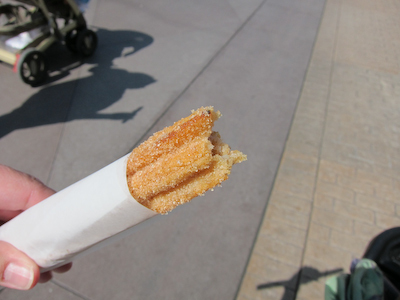 Seriously, if you ever visit Disneyland, you have to try a churro. I will buy you a churro at Disneyland. If I am not with you at Disneyland, I will Paypal you the money to buy a churro for yourself when you are there. 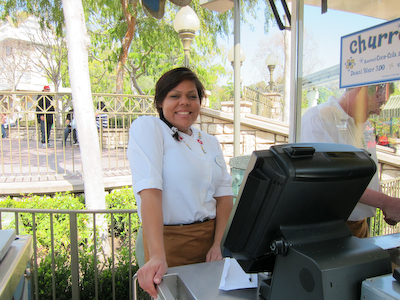 The churro cart cast member was very nice to me so I’m putting her picture here.